Today’s Gospel brings a thorny question for Jesus, as the people ask why a number of Galileans were killed by the Romans as they made sacrifices to God. The basic question is why do bad things happen to certain people? 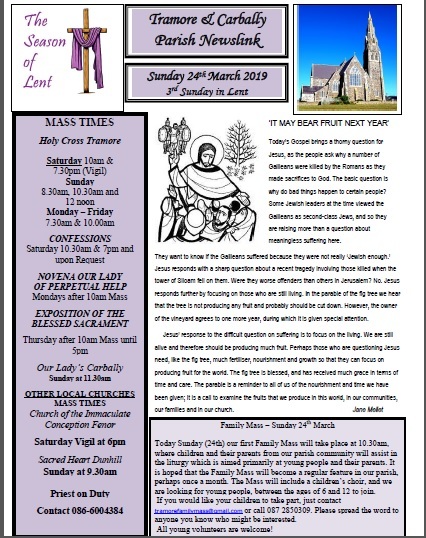 Sunday 24th March Today Sunday (24th) our first Family Mass will take place at 10.30am, where children and their parents from our parish community will assist in the liturgy which is aimed primarily at young people and their parents. I . Some Jewish leaders at the time viewed the Galileans as second-class Jews, and so they are raising more than a question about meaningless suffering here. They want to know if the Galileans suffered because they were not really ‘Jewish enough.’ Jesus responds with a sharp question about a recent tragedy involving those killed when the tower of Siloam fell on them. Were they worse offenders than others in Jerusalem? No. Jesus responds further by focusing on those who are still living. In the parable of the fig tree we hear that the tree is not producing any fruit and probably should be cut down. However, the owner of the vineyard agrees to one more year, during which it is given special attention. Jesus’ response to the difficult question on suffering is to focus on the living. We are still alive and therefore should be producing much fruit. Perhaps those who are questioning Jesus need, like the fig tree, much fertiliser, nourishment and growth so that they can focus on producing fruit for the world. The fig tree is blessed, and has received much grace in terms of time and care. The parable is a reminder to all of us of the nourishment and time we have been given; it is a call to examine the fruits that we produce in this world, in our communities, our families and in our church.